It's our great pleasure today to welcome Dr. Aoife O'Donoghue (left) as an IntLawGrrls contributor. 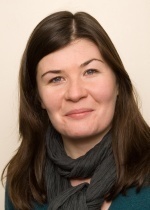 Aoife has been a lecturer at Durham Law School since 2007. She specializes in public international law, with a specific interest in international governance. Aoife's current research focuses on international constitutionalization and the legal structures that have developed within international law to regulate governance. Aoife received her Ph.D. from the University of Groningen in the Netherlands; her dissertation examined the constitutionalization of international law. Aoife earned her bachelor's degree from University College Cork, and completed an LL.M in International Law at City University, London. With another IntLawGrrls contributor, Dr. Máiréad Enright, now of Kent Law School, Aoife is a Co-Director of the Irish Feminist Judgments Project. Aoife is also co-convenor of the Law and Conflict at Durham research cluster. In her introductory post below, Aoife continues our series reflecting on the twenty-first anniversary of the publication of Feminist Approaches to International Law, which Hilary Charlesworth, Christine Chinkin, and Shelley Wright published in the American Journal of International Law. Welcome Aoife, great to see you here!